Should I See the Dentist or Go to the ER for a Dental Emergency? Dental emergencies are increasing year after year. In fact, ER visits for dental related emergencies have doubled, making this a common problem with millions of cases each year. However, many people don’t know how to handle a dental emergency or whether they should go to the ER or see a dentist. 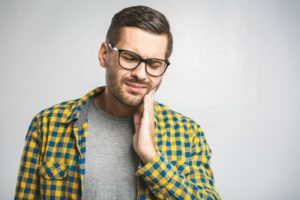 Keep reading to discover where you should go first after a dental disaster and what you can do to handle the situation from an experienced dentist. If you have an injury that is potentially life-threatening, you should visit your local hospital. Injuries like jaw fractures, jaw dislocations, infections that affect your breathing and swallowing, or serious cuts to the face require immediate attention at the ER. You shouldn’t wait to see a dentist for any of these injuries, but you should call 911 and go to the hospital as soon as possible. An abscess or infection will typically be treated by a dentist, but if it’s affecting your breathing or there is a lot of swelling, you should visit the ER to get help. How Should I Handle Dental Emergencies? If your tooth gets knocked out, it can still be saved. Pick it up by the crown (top) to avoid damaging its roots. Wash it off while leaving any attached tissue intact and then try to reinsert it into its pocket, holding it in place. If this isn’t possible, store your tooth in water or milk until you can see your dentist. The sooner you can get to your emergency dentist, the higher your chances are that it can be replanted. In the meantime, you can use a cold compress to alleviate swelling. If you fracture a tooth, try to gather the pieces and rinse them off. Even if there isn’t pain, you should visit your dentist as soon as possible. If there’s bleeding that won’t stop, an ER visit may be necessary. However, you should try to use gauze or bandages with applied pressure to stop any bleeding. Has one of your teeth ever started hurting out of nowhere? Try to floss around the tooth because it may just be some lingering food debris. If the pain persists, take some over-the-counter pain medication and use a cold compress on the outside of your face to numb the affected area. Call your dentist right away to get the help that you need. Now that you know the best ways to handle some common emergencies, you’ll be ready if disaster strikes. Contact your dentist right away if you experience any dental emergencies because time is of the essence! Dr. Gabriel Ruiz knows that dental emergencies can be traumatizing, which is why he offers same-day emergency care. He currently practices at East Brunswick Family & Implant Dentistry, and he can be reached through his website or by phone at (732) 238-6660 for any questions. Comments Off on Should I See the Dentist or Go to the ER for a Dental Emergency?